How you can use the livetrack24.com web site to it's maximum ! Use the "Sign Up" link to create your account. If you already have an account enter your username and password in the text fields. You can delete/submit your tracks without providing the track password again. The track points that your phone sends have embedded your userID so even if the first packet that has the login information is lost, the track will still be displayed as yours. You have a complete and functional Phonebook, where you can add your contacts and send them SMS. Alerts are the main security feature of LeonardoLive. 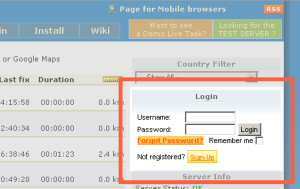 You can instruct the system to send out SMS / emails to predefined Contacts in case of Problem. Use this html code on your personal page / blog to display a small box telling your visitors whether you are live tracking or not ! to display live tracks from Greece only. The country code must be in lower-case !! !